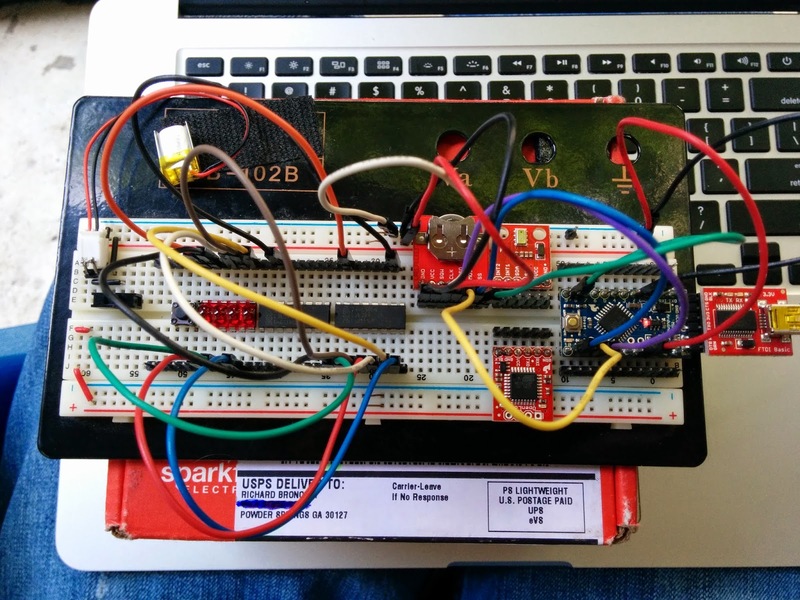 Making the first Open Source, Open Hardware, skydiving altimeter. Add to that the fact that the I2C pins on the Pro Micro are on the edge connector rather than off-grid as was the Pro Mini. This all makes the Pro Micro the better choice. I have also switched to a far cheaper option for connecting an SD card. 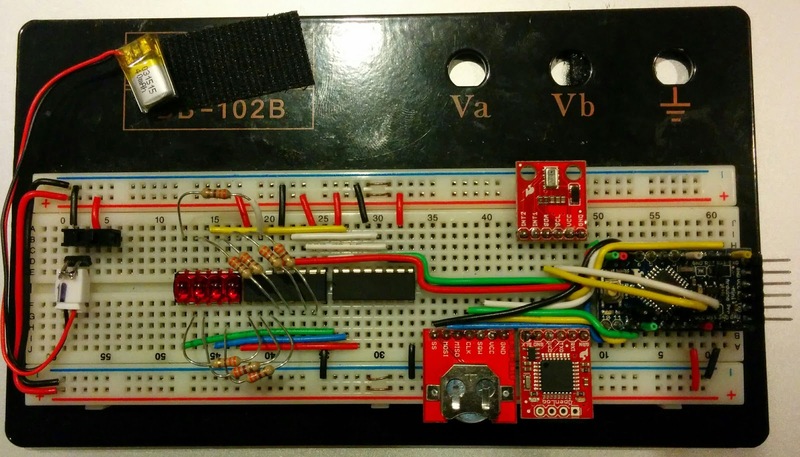 I'm now using the simple MicroSD breakout board from SparkFun. Finally, in order to make it easier to find time to do my Arduino hacking, I bought a tiny tackle box to fit my breadboard. It came from Michael's (a craft store in Georgia) but I believe it to be exactly like this one. Now I can safely toss it in a backpack and hack code on it in my spare time without having to drag it out. Just pull the USB cable out and make the most of that bus ride. In order to get the bread board to fit I did have to cut 1/4" off each side with my miter saw. Any time you are sawing plastic (especially PVC pipe) go very slowly as it tends to crack, then snag, then bind, then explode into shards. At least for now, I've finalized the wiring of the components on the breakout board. Initially I used big arcs of prefabbed jumper wires. Once I felt good about my choice of pins I went back and custom cut perfect lengths of wire to make it clean. This isn't just being nitpicking. 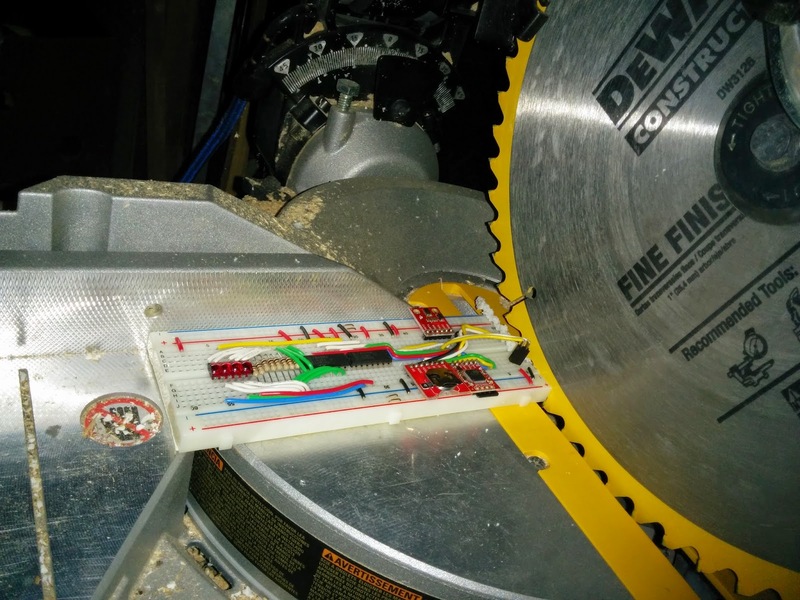 It makes the breadboard easier to inspect avoiding mistakes. It also makes the board more durable if you transport it. This is particularly important be cause many hours of development on this project have taken place at dropzones, in coffee shops, and in bars. 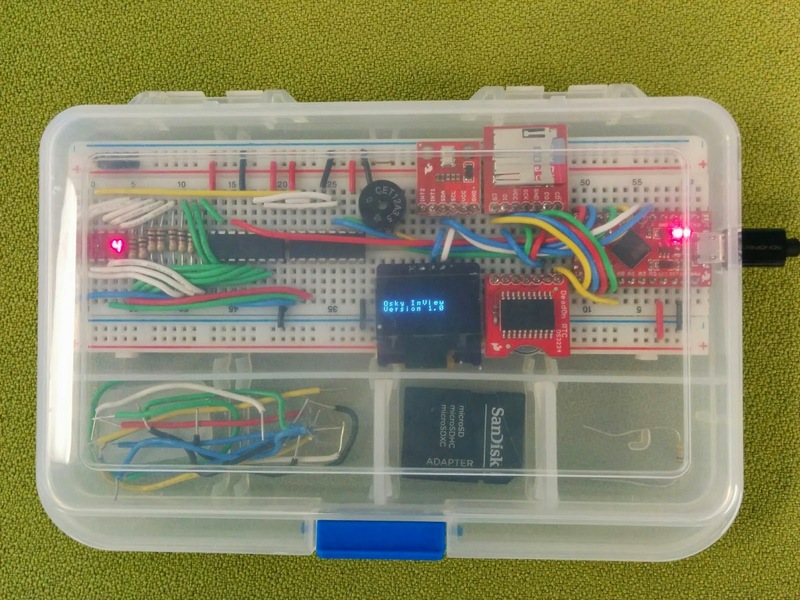 In my explorations with Arduino, I have encountered many errors with the compiler and other areas. This is a place to list those issues and their solutions in the hopes of helping others and easily fixing them next time I encounter them. Caused by calling a instance method outside of a function. This is confusing because I instantiate/initialize the object instance outside of any function, but I cannot call a configuration method on the object on the next line. In order to share the InView with the world, I'm going to have to be able to show how it's wired up. 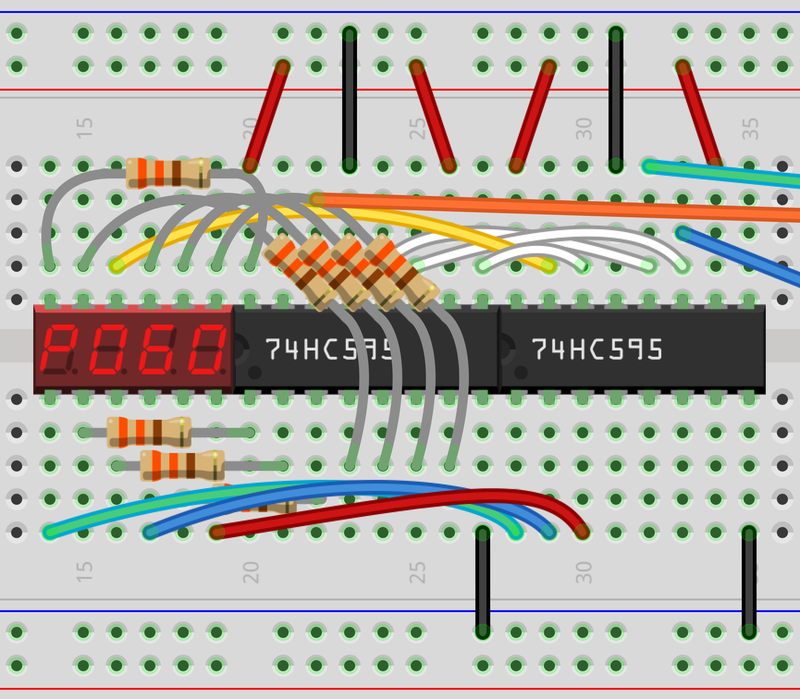 For that there is a wonderful tool called Fritzing. It already had most of the parts I needed except for the bubble display I've chosen to use on the Mk1. So, in order to get my illustration pretty, I needed to draw my own part. Just like everything else I do, I did it in a way that I believe will make it useful to others. It's simply called QDSP-6064 out on GitHub. Sometimes it's the little things that matter. Okay, so it's not going to do much to help you make your own altimeter, but the important part is that I created a github account and started a repo. So far I've only documented the hardware I've chosen. My C code is going to need a lot of work before I publish any of that. But, this is already more than any of the competitors in the market have done! If that's true it's all down hill from here. I wanted to name both the device I'm building and the organization responsible for it. I first wanted something both "techie" and skydiving related like "Blue Skies". Combined searches on a domain name registrar and a name search of the Georgia Secretary of State was pretty discouraging. After a few hours I returned to one of my first ideas of "OpenSkies" and realized that by shortening it also became personally relevant. The last half of my last name is "osky". Of course I couldn't get the "dot com" of that, but as if to confirm the name I should choose for the device, I did find osky.in available and for a good price. Up to that point I was unsure if I wanted to give the project a name that specified the form factor I intend to implement. After all, this is Open Source software and hardware. Even though you could use this project to build a wrist altimeter or a purely audible altimeter, there is no product on the market that attempts to put an altimeter on your helmet and "in view" at all times. For that reason I've decided to name the first ever "completely open" skydiving altimeter, the OSky InView. Well, it's technically an altimeter. But I will not be jumping out of a plane with it any time soon. Yesterday I received the shipment from SparkFun. I soldered headers onto all of the PCBs. I positioned them on a breadboard, and had the discipline to walk away. This morning I got up at 5am and got started. I've managed to accomplish 6 of this weeks development goals. That's pretty amazing because I only expected to accomplish the first 2. Copyright (c) 2014 OSky InView. Offered under the terms of The MIT License (MIT). Simple theme. Powered by Blogger.